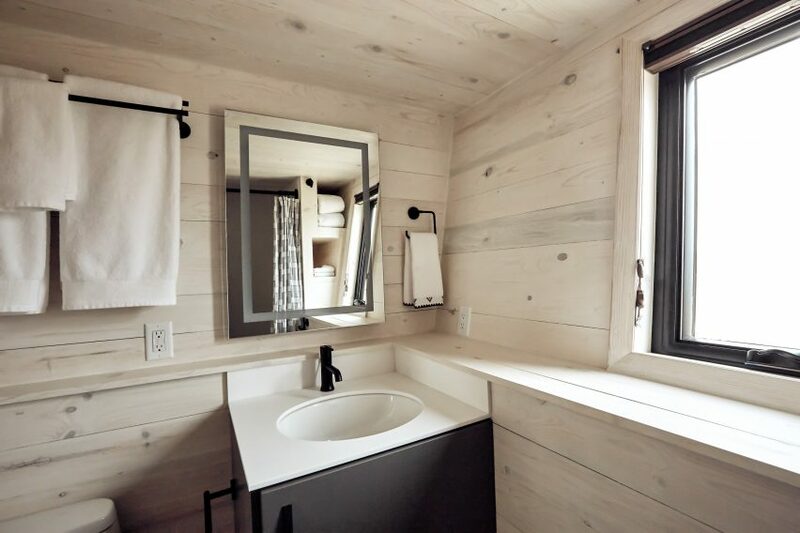 Colorado startup Land Ark has revealed its first mobile home, which features angled walls, black metal cladding and an interior wrapped in white-washed pine. Encompassing 357 square feet (33 square metres), the Drake is the debut camper from Land Ark. The company was founded in 2016 by husband-and-wife team Brian and Joni Buzarde and is based in Buena Vista – a town in central Colorado. The couple formerly lived in Texas, where Brian studied architecture, and Joni studied management and marketing. In 2011, the two decided to purchase a home. 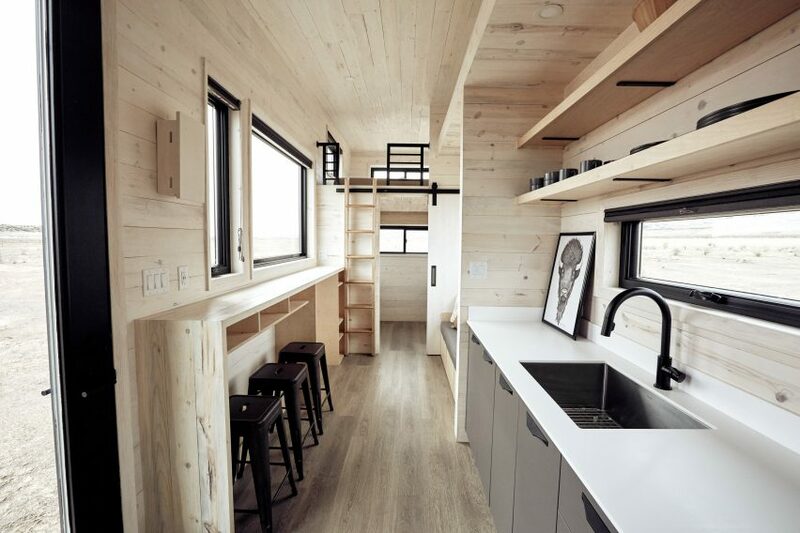 Uncertain of where their careers would take them, they set out to buy a small mobile dwelling – but they couldn’t find a suitable option on the market. 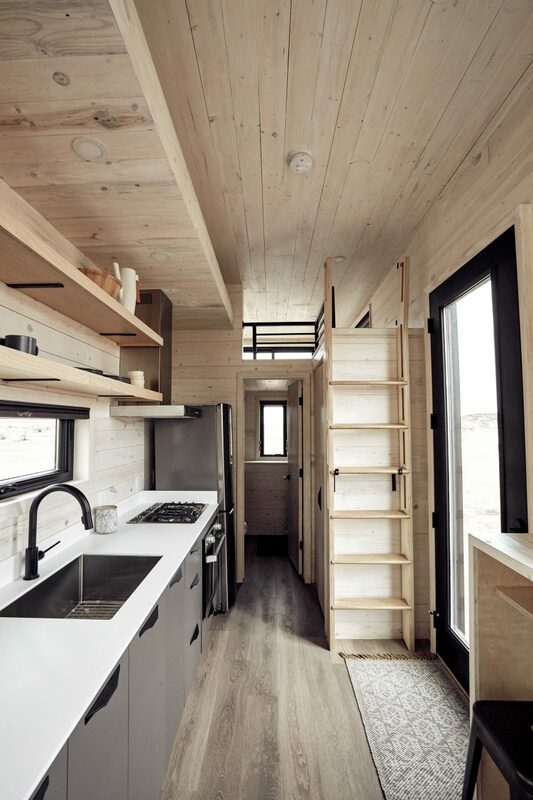 Tiny homes had become popular, but in terms of aesthetics, none of the existing models resonated with the Buzardes. Plus, many micro dwellings are intended to be stationary. The couple also explored a range of recreational vehicles (RVs) but were unimpressed. “RVs are brilliant for what they’re designed to do – travel as easy as possible – but for the most part, there’s a lot lacking with them if you’re going to park and live in one year round, especially in extreme climates,” Brian Buzarde told Dezeen. Their initial prototype, Woody, was completed in 2012. It looks similar to the Drake but is considerably smaller, at 236 square feet (22 square metres). The couple has been living in the travel trailer, testing its functionality and making modifications to their design. Designed to be hitched to a sturdy vehicle, the Drake weighs approximately 17,600 pounds (8,000 kilograms). Rising just over 13 feet (four metres), the dwelling is approximately 30 feet long and 8.5 feet wide (nine by 2.6 metres). The design was driven by the notion of “form following function”, said Buzarde. 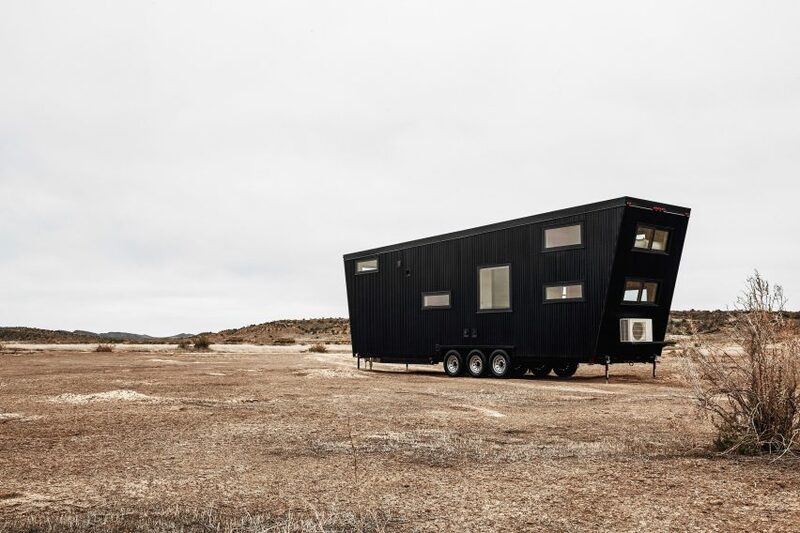 Rather than being a simple box, the camper has angled walls, giving it a sculptural appearance. “The front and back walls flaring out not only creates more usable space with the same footprint, but perhaps more importantly it makes the space feel expansive rather than boxed in,” Buzarde said. The frame is made of cold-rolled steel. Exterior walls are clad in corrugated black metal and are punctuated with an array of different-sized windows. 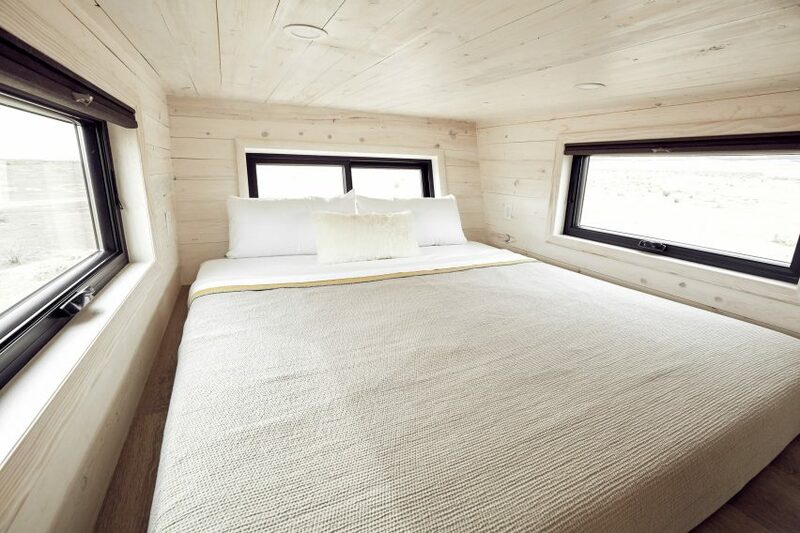 An extra layer of insulation enables the camper to stay cosy during heavy snowstorms. A glass door leads into the dwelling, where one finds a linear layout. The centre portion encompasses a kitchen with stainless steel appliances, bar-style seating and an “entertainment area” that sits across from a built-in sofa. Both ends of the dwelling contain sleeping lofts, accessed via movable ladders. Underneath one loft is a bathroom with a toilet and a tub/shower, and below the other is a flexible room with a barn door and two built-in closets. The camper can sleep up to seven people. The home is fitted with LED lighting, and waterproof vinyl flooring that resembles wood planks. The ceiling and walls are wrapped in white-washed pine, giving the interior a bright and airy feel. “Psychology and emotional response play big roles when you’re living in such a relatively small space, so subtle moves can have a large impact,” said Buzarde. The Drake is listed at $139,000 (‎£105,150). It takes approximately three to four months to build the dwelling, according to the Land Mark website. 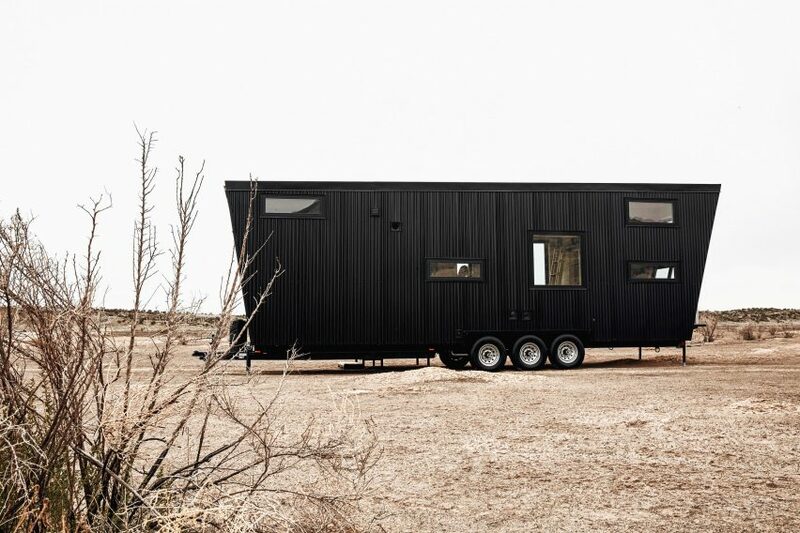 The company plans to release a second mobile home design later this summer. 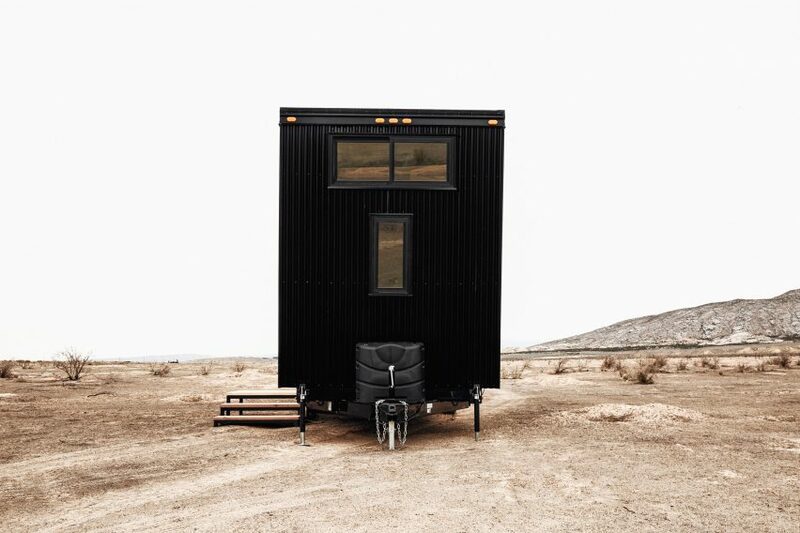 As nomadic lifestyles become increasingly popular, architects and designers have responded with a range of mobile home designs. 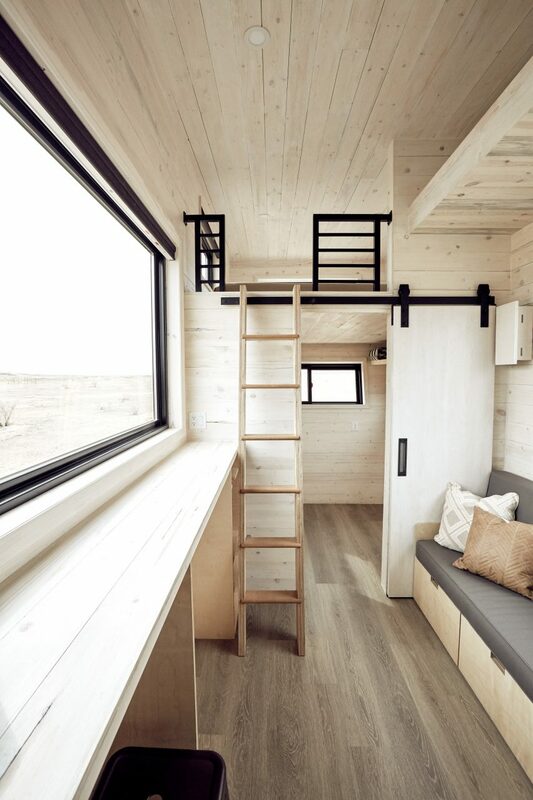 These include a camper by Belgian architect Axel Enthoven that resembles the Sydney Opera House and a wood-clad RV masquerading as a tiny cottage by Escape One XL. Photography is by Jeremy Gudac.